The other night I was showing Seb the pictures of the kids that I had taken that day on my phone, as we do almost every night. He got to this one and zoomed in. “Gosh, she’s beautiful, isn’t she?” he said. First off, if you know him, you know things like that don’t come out of his mouth very often. And I’m sure several of you are going to pipe in and say how gorgeous she is (I’m looking at you, Mom!). But that’s not what this is about. 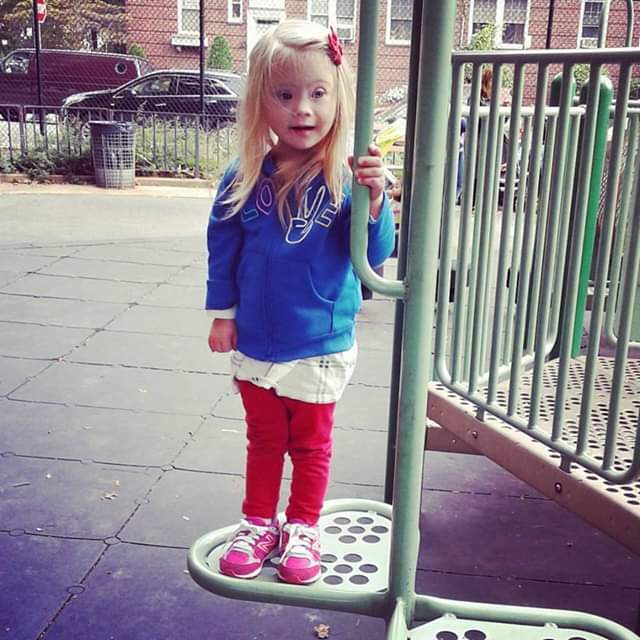 You know what surprised me most about having a child with Down syndrome? It’s just how “normal” life is. How we spend our evenings talking about the smart, funny, adorable things BOTH our kids did today. How we are so proud of their accomplishments big and small. How we are still so taken aback by just how beautiful they are! Probably exactly the way you feel about your kids, too. I’m ashamed to admit that when Frankie was born, I was worried she wouldn’t be pretty. I let my heart and mind be ruled by what I thought I knew about Down syndrome. But the reality is beauty and Down syndrome have nothing to do with one another. I think she’s breathtaking because she’s got an unbreakable spirit and a fire in her eyes. And because she’s mine.